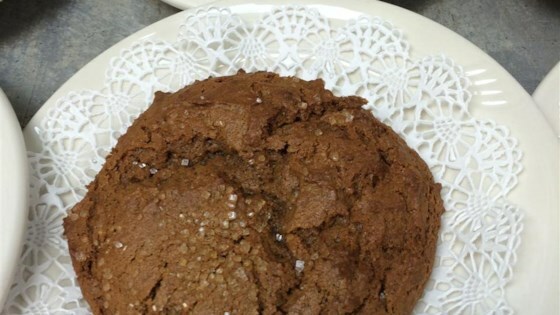 "This is my mothers molasses cookie recipe.. They are very good. A very old fashioned recipe, no one will ever guess the secret ingredient. For a fun variation, substitute maraschino cherries for the raisins." Preheat oven to 375 degrees F (190 degrees C). Lightly grease a couple of cookie sheets. In a large bowl, cream together the sugar and lard. Gradually mix in the egg, and molasses. Sift together the flour, baking soda, ginger, dry mustard, instant coffee, and cloves; stir this into the creamed mixture alternately with the milk. Drop cookie dough by heaping teaspoonfuls onto the prepared cookie sheets. Press a raisin or maraschino cherry into the center of each one. Bake for 15 minutes in the preheated oven. Remove from baking sheets to cool on wire racks. These cookies are flavorful yet texture is crumbly & somewhat dry. Great fluffy texture but a little flat on flavour. I'll certainly use this as a great base the next time I want a soft molasses cookie and play around a bit with the spices. Used half butter and half shortening. Out of ginger so used pumpkin pie spice. Sprinkled tops with sugar. They were soft and delicious !